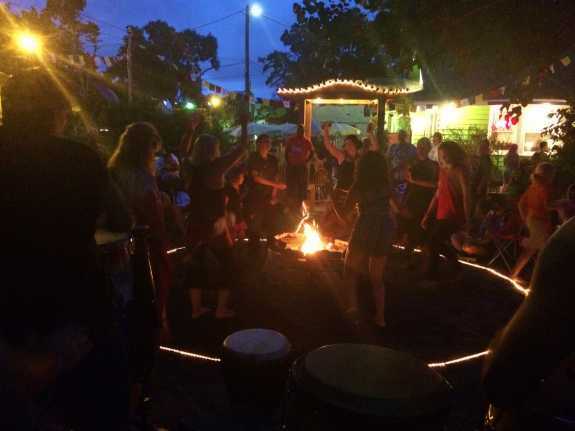 Each new and full moon, the Florida School of Holistic Living hosts a drum circle outside Orlando’s Dandelion Café. The next moon circle is October 8, so 90.7’s Amy Kiley stopped by the last one in September. Amy spoke with school director Emily Ruff and percussionist Martin “Wolf” Murphy. He’s a regular attendee and author of The Encyclopedia of World Rhythms. The Florida School of Holistic Living hosts a drum circle every new and full moon from 7-10 p.m. outside the Dandelion Café. Click above to hear the interviews or see video from the moon circle Amy attended. Click below to hear more audio from it.